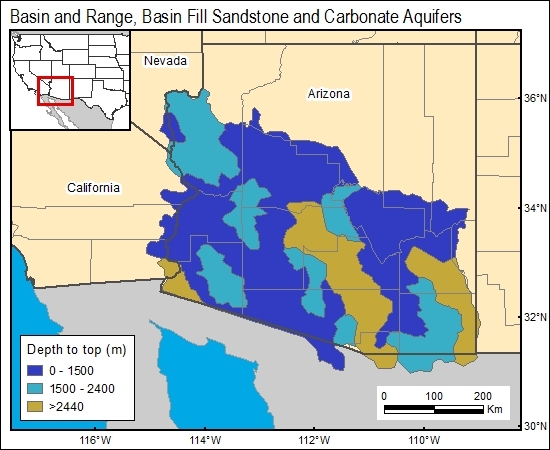 Depth of basin-fill and carbonate aquifers in the Mojave Basin and adjacent areas was discussed by Planert (1996) and Robson (1996). Depth to basement in the Arizona part of the Mojave Basin was shown by Pool (1985). Pool, D. R., 1985, Aquifer geology of alluvial basins of Arizona, in Anderson, T. W., and Johnson, A. I., eds., Regional aquifer systems of the United States, southwest alluvial basins of Arizona: American Water Resources Association Monograph 7, p. 25–36.